Every common or important person of the world has expressed his views about the prime minister of india shri narendra modi ji and they have appreciated him. they have commented upon his diverse aspects of his personality but one aspect of his personality is being a micro observer and a sensitive poet. he writes very good poems in his mother tongue gujarati and by reading these poems many windows of his personality are opened. his collection of poems 'ankh aa dhanya chhe (ankh ye dhanya he)' was published in gujarati language in the year 2007 in which beautiful pictures also published with 67 poems which entices the mind. being an active journalist my familiarity with sh. 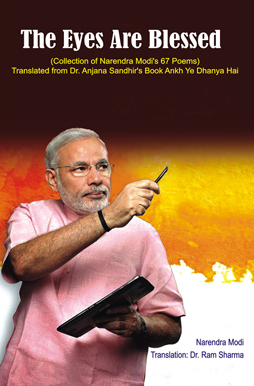 narendra modi ji is from that time when he returned from kashmir after unfurling the tri-colour for the first time and there was a special meeting by bhartiya janta party in the basement of m.j. library of ahmedabad in which dignified scholars, writers and some important journalists were invited. in this meeting the senior leaders of bhartiya janta party shri lal krishna advani, m.p. from gujarat shri haren pathak and many party workers of b.j.p. were included in which the back of shri narendra modi, young party worker was patted because he has done the difficult work. in the same meeting i was also invited as a writer and an active journalist. in the year 1995 i went to america after marriage. in the meantime the political fame of modiji kept on raising and he became the chief minister of gujarat. i kept on coming to india in every two years. in my every country travel i used to meet him voluntarily and i used to gift him the books of american-hindi literature which i edited and they used to appreciate my work. while teaching hindi as a foreign language in columbia university of new york i searched a new pattern to teach hindi by using film songs and wrote a book titled "learn hindi and hindi film songs because you can not teach hindi as grammar teacher [ shastri scholar] to foreign students. this method proved very useful because our film songs have language and grammar.